Whether you like it or not, sports will always be an integral part of this town. Even if you couldn’t care less where the Leafs are on their annual roller coaster, at the very least you have to occasionally deal with rowdy fans in jerseys on the subway, or the front of a bus cheering a team on on come playoff time. Or Jurassic Park. You probably know of those Leafs, that is the Toronto Maple Leafs, our hockey club, and maybe you’ve even heard of the Toronto Maple Leafs, the minor league baseball team that plays at Christie Pits. But did you know about the other other Toronto Maple Leafs? As well as having the most legitimate claim to the name, they may have had the sweetest looking sports facility to ever grace our shores. The (other other) Toronto Maple Leafs Baseball Club was a semi-professional baseball team whose first iteration played in the International League starting in 1886. The International league was one of a few semi-pro baseball leagues playing in the US and Canada, and Toronto was one of the founding 10 teams. As a sidenote, I don’t really understand why Maple Leafs is a name of any sports team at all, but I think it’s worth noting that the Toronto Maple Leafs of the International league had the name first, and the Toronto St. Patricks (St. Pats for short) of the NHL took on the name in 1926. Then in 1969 The Toronto Maple Leafs of the Intercounty League (the ones that still play at Christie Pits) came into being. I understand it’s distinctly Canadian, but…what about…the Lumberjacks? Or the Moose? That’s ferocious plus it would make a great mascot. 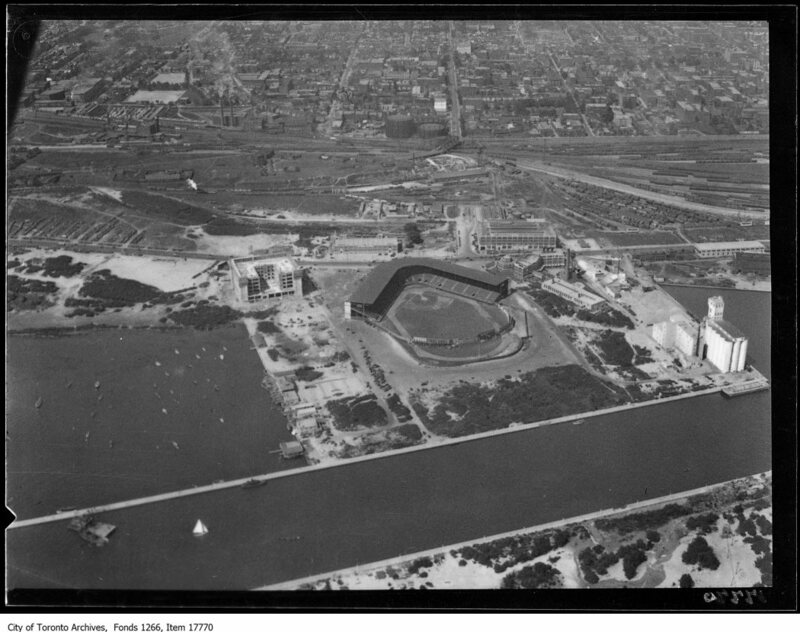 As of 1925, the Toronto Maple Leafs Baseball Club had played in a couple different diamonds around the city, their most recent home being Hanlan’s Stadium, which was on part of the site on the Toronto Island that is currently occupied by Billy Bishop Airport. In the fall of 1925, the International League was still a class below the American League and National League (which made up Major League Baseball), but nevertheless, there was excitement brewing for the future of professional baseball in Toronto. 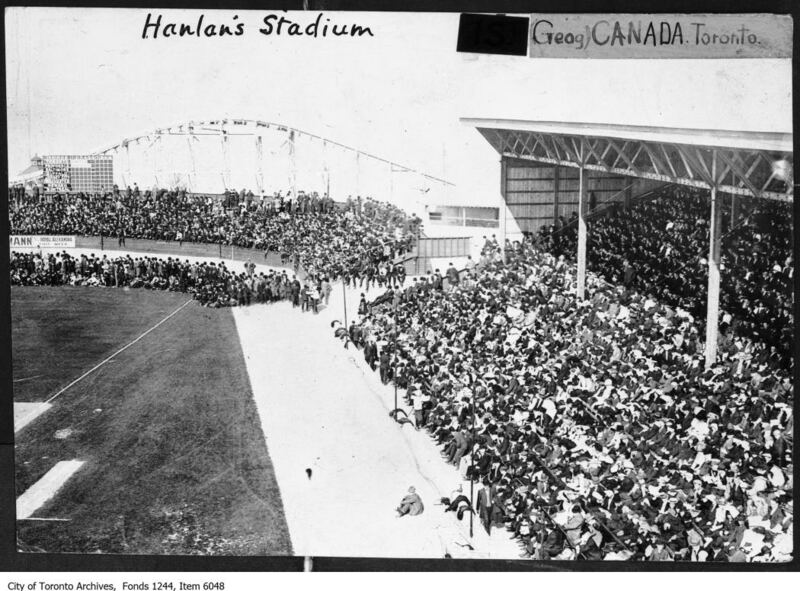 Hanlan’s Point Stadium in 1912. Looks like an island party! 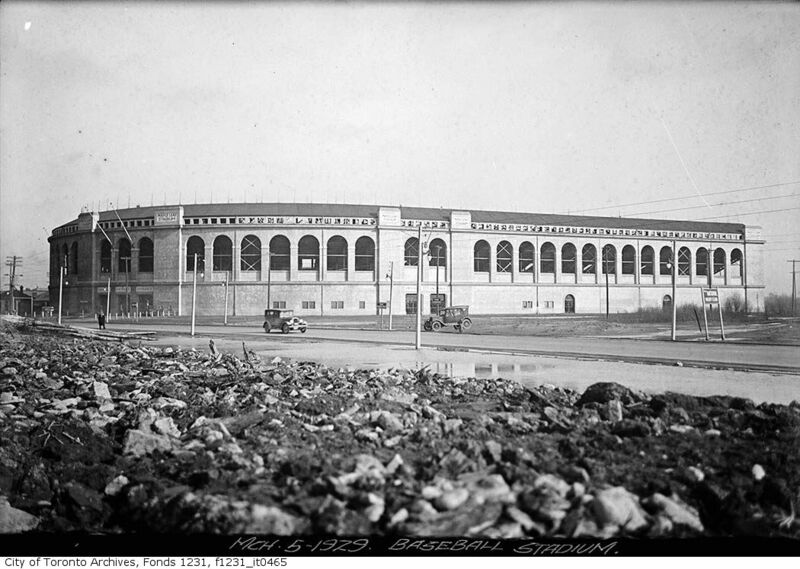 There was a new stadium, to be called Maple Leaf Stadium, that was going to be built for the start of the 1926 season. 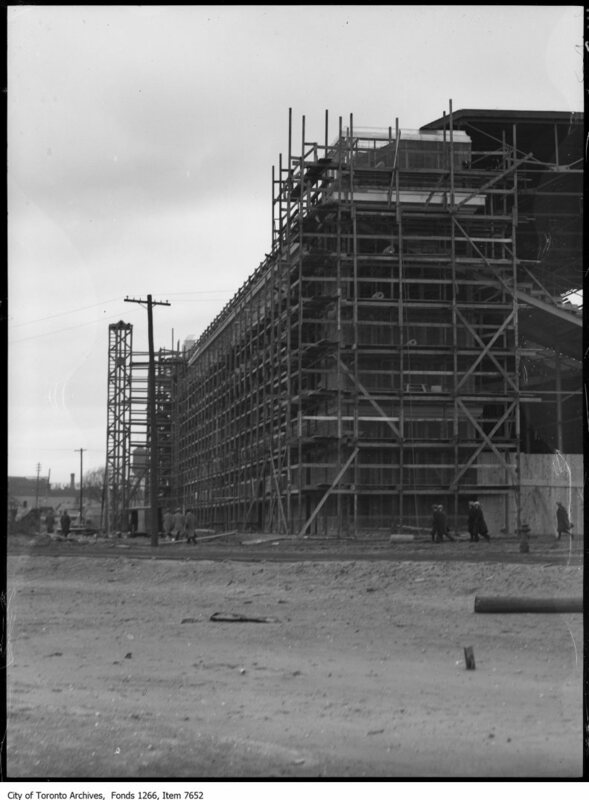 It was heralded as a stadium that would be a state of the art facility, one that would be a jewel of downtown, with attendance rates that would soar above the rest of semi-pro baseball in America (which I’m genuinely not sure is saying much). Personally, it was refreshing to see that the stadium itself was named after the headliner team that played there. If it were to follow current sports venue corporate naming trends, I’d probably be writing about Hiram Walk – Gooderham & Worts Field or the Heintzman & Co. Coliseum (maybe just Heintzman & Coliseum). 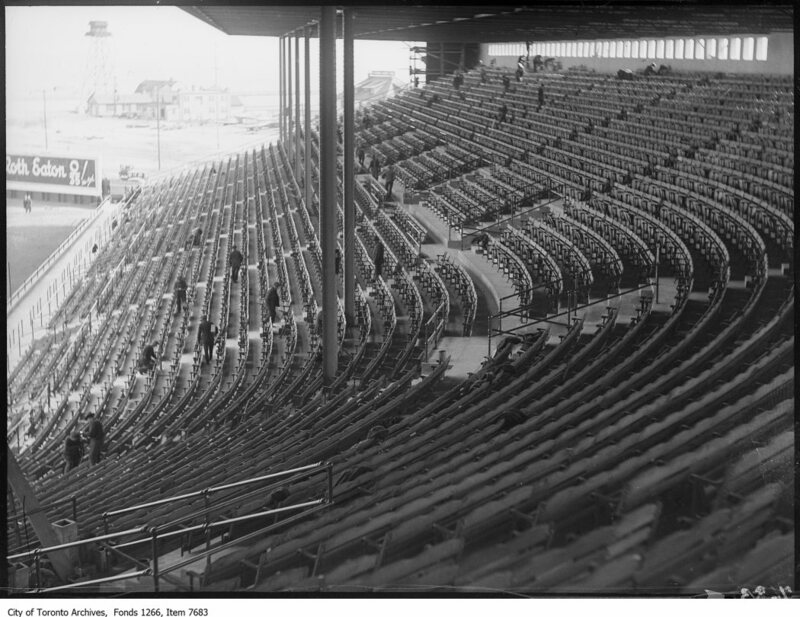 Before it was built, Maple Leaf Stadium was projected to seat 30,000, have portable bleachers to accommodate the playing of multiple sports, and cost about $300,000, which is about $4 million in 2014 dollars. Not a paltry sum, but not in the same league as this kind of craziness. An ad from the Globe & Mail for the opener. First of all, who has time to go to a baseball game at 3:00 PM on a Wednesday? Second of all, I think it’s hilarious that tickets were on sale in the Men’s Hat Department of the Eaton Centre. A sneak peek of the new stadium under construction on April 25th – just a few days before it opened. Incredibly anti-climatically, the game was postponed until April 29th because of rain, and on the 29th the weather was almost as terrible as the previous day, so only around 16,000 people showed up to cheer on the Maple Leafs. It actually sounds like it was an AWESOME game – the Leafs were down 5-0 going into the bottom of the ninth before rallying for 5 runs and then taking the game 6-5 in the 10th inning. A shot from the sky. I want this to still exist, please. No bad seat in the house! This is taken from the East side. I wonder if anyone ever got a broken windshield? Or how on earth anyone ever got out of that gridlock?! Not only did the Toronto Baseball Club crush it for the hometown crowd for the first ever game in Maple Leaf stadium, they ended up going on to win it all in the fall of 1926. I just gotta say, it’s nice to talk about the Maple Leafs doing well. Another sidenote, one of my favourite tidbits from researching Maple Leaf Stadium was finding out the owner of the team who was behind the majestic masterpiece was none other than Lawrence Solman, whose nickname was “Sol” or “Lol.” Based purely on his nicknames, dude sounds quite jolly. Over the years the stadium was used for plenty more than just the International Baseball League. The Intercounty league played there occasionally too and there were little league world series’, Senior’s world series’, student athletics tournaments, track and field competitions, rodeos, concerts, circuses, boxing matches, and I’m sure teenagers sneaking in to party. Or stargaze. Of course, the downfall of any once-state-of-the-art facility is unfortunately very predictable. The Leafs enjoyed the stadium through the 20s and 30s, and they had their highest attendance ever for their home opener in May of 1949 (22,206 people, probably all wearing cool hats). Even though the team’s popularity (and subsequently its average attendance numbers) peaked in the early 1950s, by the mid 1960s Maple Leaf Stadium was averaging only about 2,000 people per game and was in dire financial straits. The upkeep and maintenance on a 30 year old stadium started to become unbearable. In a rather desperate attempt to try and throw a line to the floundering team, the city of Toronto waived their $30,000 tax on Maple Leaf Stadium in both 1965 and 1966, but it wasn’t enough. Despite the fact that they were the only vestige of almost pro baseball left in town, the team finally went under in October 1967 and was moved to Lousville after over 80 years of hitting dingers. Over that span they won 12 championships and played over 11,000 games (not just at Maple Leaf Stadium, I mean everywhere and all time. If they played 11,000 games at the stadium that would be 275 home games a year. I know the MLB has a ridiculous schedule, but I’m sure even the actual baseball would get sick of baseball with 275 games a year). Back to the real hero of the story: That wicked cool stadium. The owner of the land, the Toronto Harbour Commission, was quite quick to get rid of what was now seen as an eyesore on the waterfront. It was dismantled in 1968, less than a year after the team moved. Today the land is made up of some apartment buildings, a parking lot, Queen’s Quay (which would’ve run through somewhere in the outfield) and Little Norway Park. 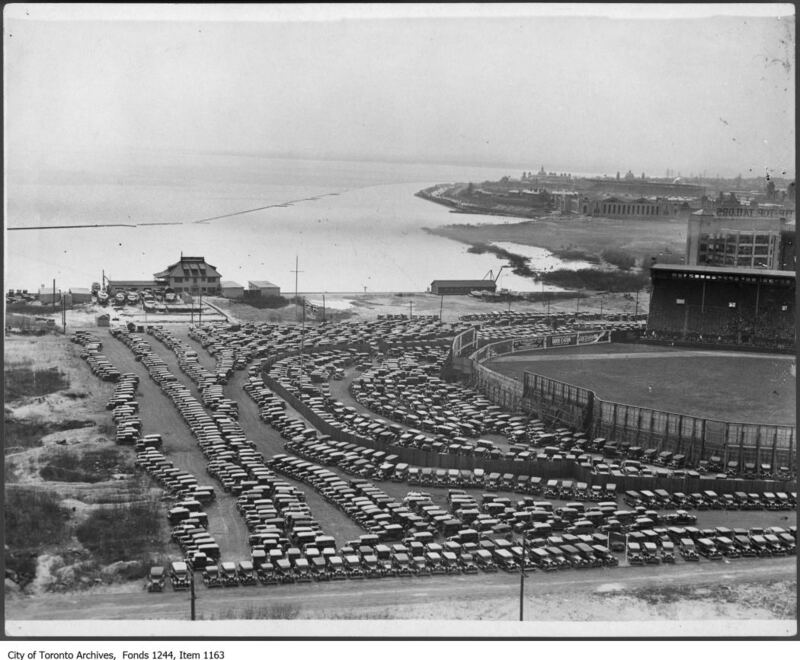 If you’re ever down in the area, keep an eye out for the only throwbacks to the heyday of the other other Toronto Maple Leafs: Stadium Road, a little road which runs south from Lakeshore to the water, and yes, a little baseball diamond in the park near the shore.